Be the first to share your favorite memory, photo or story of Elizabeth "Beth". This memorial page is dedicated for family, friends and future generations to celebrate the life of their loved one. 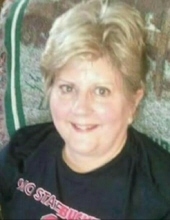 Elizabeth “Beth” Genter, 63, of Napoleon, passed away on Friday, January 25, 2019 at Genacross Napoleon Nursing Home, in Napoleon. She was born on June 25, 1955 in Napoleon to C. Lyle and Ilene J. (Sattler) Sheller. She married Dale Genter on December 27, 1975 in Deshler, and he survives her. Also surviving are her children, Aaron (James Villa) Genter, of Holland, Jodi (Jon) Shultz, of Columbus, and Austin (Crystal) Genter, of Ridgeville Corners; her father Lyle Sheller, of Malinta; one sister, Mary (Dan) Leininger, of Archbold, and one brother, Charlie Sheller, of Malinta. She was preceded in death by her mother, Ilene. Beth was a 1973 Patrick Henry High School graduate, where she was involved in the band and choir. She went on to achieve a nursing diploma from Toledo Hospital in 1976, and then received her Bachelor of Science Degree in Nursing from The University of Toledo in 1998. A Registered Nurse for 43 years, Beth was very compassionate and dedicated her life to helping and saving others. Beth enjoyed cooking, making most everything from scratch and often obtaining herbs from her own garden. She loved to have cookouts with her family, using the meat smoker to perfect just the right meal along with plentiful other homemade dishes, no one ever went home hungry. She was very hospitable and liked to entertain. At holiday time she even made her own candies. Beth also enjoyed gardening, knitting and quilting, as well as traveling. Visitation will be held from 2 until 8 pm on Tuesday, January 29, 2019 at St. John Evangelical Lutheran Church, Stryker. (Corner of Highway 6 and 66 N.). Visitation will continue at the church on Wednesday from 10 am until the time of the funeral at 11 am, Pastors Lee Genter, Dale Kern, and Jeffrey Corder presiding. Burial will follow in the church cemetery. Snyder-Wesche-Hoening Funeral Home, Napoleon, has been entrusted with arrangements. Memorial contributions may be considered to church’s bell tower fund. Online expressions of sympathy may be made by visiting www.hoeningfuneralhome.com. To send flowers or a remembrance gift to the family of Elizabeth "Beth" Genter, please visit our Tribute Store. "Email Address" would like to share the life celebration of Elizabeth "Beth" Genter. Click on the "link" to go to share a favorite memory or leave a condolence message for the family.